My husband and I have been avid Star Trek fans since TOS (The Original Series) came out in 1966 (yes, that dates us!). As such, we've enjoyed seeing the many products come out with designs from various Star Trek television shows and movies over the years. If you're also a fan of this well-loved science fiction franchise, you will enjoy looking through these items for the bedroom and bathroom, including shower curtains, towels, bath robes, and pajamas. Many of the designs I feature on this page include the different Federation insignia and colors that represent the divisions within Starfleet (command gold, science blue, engineering/ops/security red). But there are other cool designs as well that show other Star Trek themed images and sayings. Most of the designs are patterned after The Original Series Star Trek television show, and will be appreciated by all fans of the different series. Of course these all make great gifts for any Trekkie or Trekker! 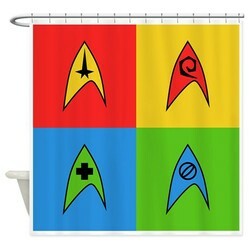 I love the Pop Art pattern of this first shower curtain from CafePress, with its bold blocks of background color which set off the four different Federation insignia representing the different divisions within Starfleet. Gold represents command, blue is for science and medical, and red represents engineering/ops/security. To round out the shower curtain, a green medical insignia has been added. The curtain is 69" x 70", and made of 100% softened polyester. The second selection is a fun two-piece set that includes a TOS (the original series) Transporter Room shower curtain AND matching transporter platform bathmat (so you can stand on the "platform" in readiness for transporting into your shower). This curtain measures 72" x 72" and the mat is 26" diameter. Both are made of polyester. I do have to admit that neither set is cheap (in my opinion). But if you're really into Star Trek memorabilia, or if you're looking for a special gift for your favorite Trekker or Trekkie, the cost is well-worth it. When you come out of your shower from behind your Starfleet insignia curtain or transporter curtain, you can dry off with an a Star Trek themed bath or beach towel. Choose from an elegant and understated 3 piece set (bath towel, hand towel, wash cloth) or a large and bold Starfleet Command / Federation of Planets logo on a beach towel. The three towel set, made from 100% cotton, could be similar to what you might have used as a crew member aboard the Enterprise itself. Various icons and images on the three towels include "NCC-1701" (the registry number for the Enterprise), an image of the Enterprise, UFP (United Federation of Planets) banner, and the words "To Boldly Go". The Starfleet Command towel, made of light weigh polyester, is really sized for the beach, but you can certainly use it in the bathroom as well! Each robe has an embroidered insignia on the front, and the rank braid on the sleeves. The slippers are fun-looking too, and very comfortable, and as you can see, they come in the standard three colors with appropriate insignia as do the robes. The bottoms have non-skid dots for extra stability. They come in a variety of sizes for men and women. Depending on the season, and your preference for sleepwear, you could wear these warm and comfy TOS pajamas, or the lighter, cooler briefs (t-shirt optional). as with the robes and slippers above, you can choose from the main three Star Trek uniform colors: command gold, science / medical blue, engineering / security red. The pjs and the briefs are made from 100% cotton. Note that both run a little on the small side, especially after you wash them. For the briefs especially, order the next size up! 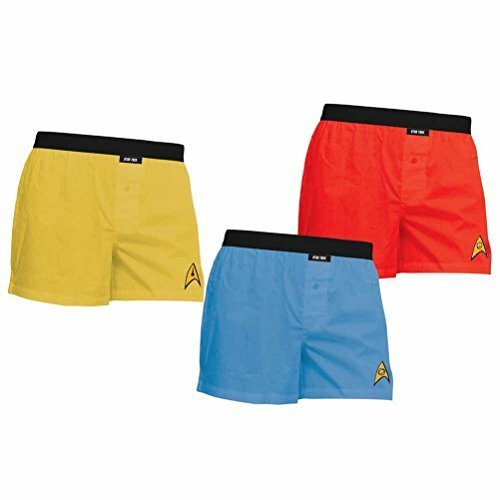 I've shown the unisex TOS Star Trek pajamas here, but ThinkGeek also carries TNG (The Next Generation) pjs, ladies short sleeved shirt pajamas, and ladies sleep shirts (more like the short dresses from the series). Are you a Trekkie or a Trekker? Do you consider yourself to be a Trekkie or a Trekker (yes there is some difference! ), or just a fan but not such an intense one? The Star Trek franchise has been around since The Original Series of Star Trek first aired in 1966, and it has been a cult phenomenon for scifi fans and idealists over the last few decades. In 2016, this beloved universe will have been around for 50 years, and it will be celebrated in part by the release of the third "alternate timeline" Star Trek movie in July, 2016. Since the inception of Star Trek, there have been many fans of different levels of intensity. A fun overview of the difference between "Trekkies" and "Trekkers" can be read on Trekker vs Trekkie: The Controversy. Basically a "Trekker" isn't quite as fanatic as a "Trekkie". Are you a Trekkie or Trekker? Or just a fan? I'm a Star Trek Trekkie all the way! I wish I would've been born a couple centuries from now so I could apply to Starfleet and travel through the galaxy! Definitely a Trekker! While I love to dress up and go to conventions (or I WISH I could go to conventions!) I'm firmly rooted in reality...unlike those crazy Trekkies! I'm an avid fan of some or all of the Star Trek phenomenon....but I'd be so embarrassed to be associated with either Trekkies or Trekkers. I'll just watch the series and movies and not go to conventions. Meh, not really a huge fan of any of this. I'm just browsing for gift ideas for a crazy fan. Are You Looking for More Fun Star Trek Stuff? Functional Star Trek Kitchen Gadgets and Accessories - Here are a few fun items that will help you out in the kitchen (my favorite is the Enterprise pizza cutter). The Big Bang Theory - Sheldon as Spock Action Figure - This combines elements of a couple of shows I enjoy: The Big Bang Theory and Star Trek. The geeky, brilliant Sheldon on TBBT is a huge fan of the ever-logical Spock. I want that curtain too, Digby :-) At least I'd like to have it up some of the time! I really want that transporter room shower curtain! I'd love to put it in the guest bathroom and surprise people. Not just any screwdriver, but The Doctor's sonic screwdriver! This device is used in the Doctor Who series for many purposes, including picking locks and tracking alien life.